Ripples of excitement spread through the world of science this week as astronomers revealed the first ever images of a black hole, created using reams of telescope data by MIT's Dr Katie Bouman. Black holes must rate as one of our Universe's most mysterious phenomena - colossal, monstrous objects that devour any matter and light that dares get too close. The images show "light swirling around the event horizon of a black hole right before falling into it, never to be seen again", UWA's Teresa Slaven-Blair told the AusSMC. "It’s this evidence of light being removed from the Universe that is so amazing." Monash University's Professor Ilya Mandel says that this particular black hole is in Messier 87, a galaxy in the nearby Virgo cluster, and that it weighs "a whopping 6 billion times the mass of the Sun". It lives "more than 50 million light years away", he added. So, how do you snap something in a galaxy far, far away? Swinburne University's Dr Adam Deller says the team behind the image used radio telescopes thousands of kilometres apart and lined up their signals with extraordinary precision, "to around a millionth of a millionth of a second". That allowed them "to make phenomenally sharp images – if your digital camera was this good, you could take a photo of a person hundreds of kilometres away and make out individual strands of hair on their head," he said. "They used this capability to capture the shadow that a supermassive black hole casts – it’s the first time astronomers have ever really 'seen' a black hole." "For decades, we have been studying black holes but could only indirectly see the effects of their extreme masses and gravitational fields," he said. "The images show, for the first time, the point close to the black hole from which nothing can escape, even light - the so-called event horizon...confirming the predictions of General Relativity." "Einstein’s theory passes yet another test," confirmed OzGrav's Dr Daniel Reardon. "It's a monster, but a very law-abiding one, precisely following the rules laid out by General Relativity," said Professor Mandel. Read Professor Alister Graham's article in The Conversation: Observing the invisible: the long journey to the first image of a black hole. big milestones for OzGrav-UWA's low latency pipeline SPIIR! Congratulations to Prof Linqing Wen, Dr Qi Chu and the group at UWA, as their SPIIR pipeline officially joins the LIGO-Virgo automatic public alert processing! 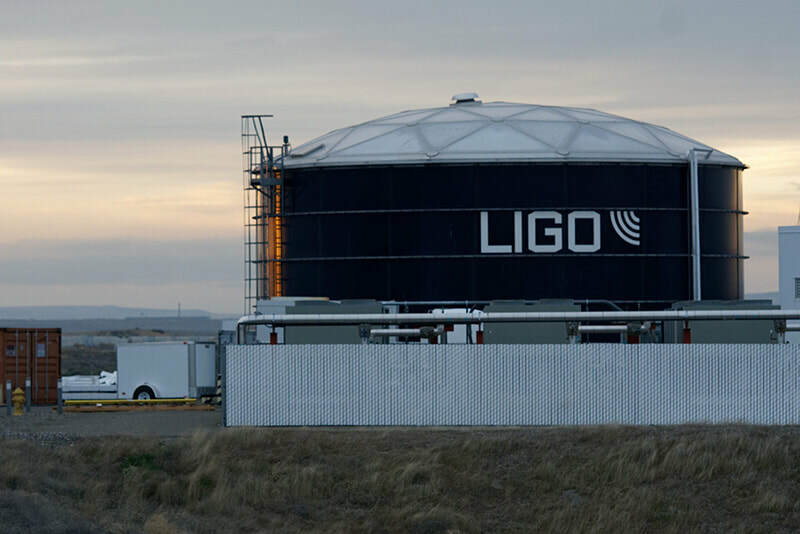 The SPIIR pipeline also reached another major milestone this week, as it detected the first binary black hole candidate from the LIGO-Virgo 3rd observating run. ​SPIIR is an online low-latency real-time search pipeline to detect binary mergers from ground-based detectors. Wen's group harnesses the computational efficiencies of parallel processing using Graphics Processing Units (GPUs) in order to make the detections as fast as possible. This is especially important for mergers that produce electromagnetic radiation that can be observed by telescopes. Researchers from the ARC Centre of Excellence for Gravitational Wave Discovery (OzGrav), as part of an international team of scientists, are set to resume their hunt for gravitational waves - ripples in space and time - on April 1. They will be taking full advantage of a series of major upgrades to the LIGO detectors. LIGO - which consists of twin detectors located in Washington and Louisiana, USA - is now about 40% more sensitive, which means that it can survey an even larger volume of space for powerful, wave-making events, such as the collisions of black holes. Joining the search will be Virgo, the gravitational-wave detector located at the European Gravitational Observatory (EGO) in Italy, which has almost doubled its sensitivity since its last run and is also starting up April 1. 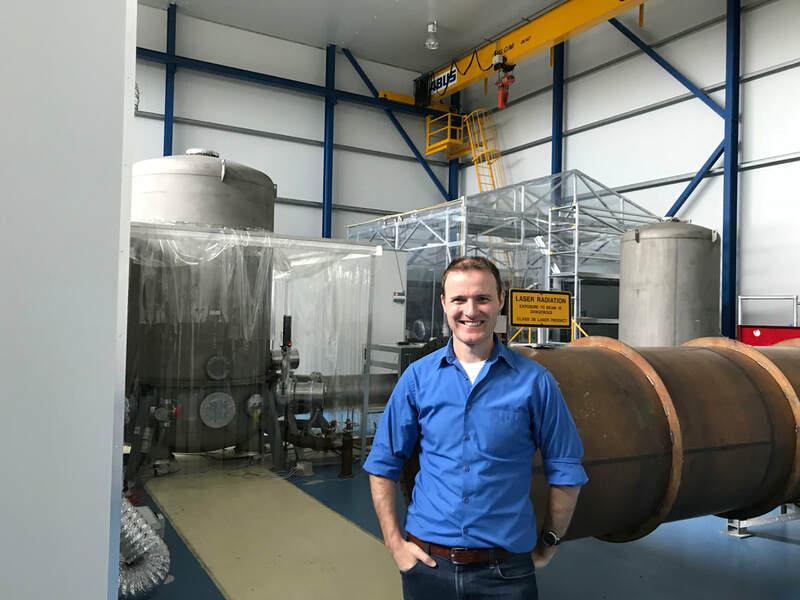 Over at University of Adelaide, OzGrav postdoctoral researcher Dan Brown has also been working on developing new systems to improve LIGO’s performance. Says Dr Brown, “The group at Adelaide have been developing a variety of new sensors and adaptive optics to compensate for thermal effects from the detector’s increased laser power. 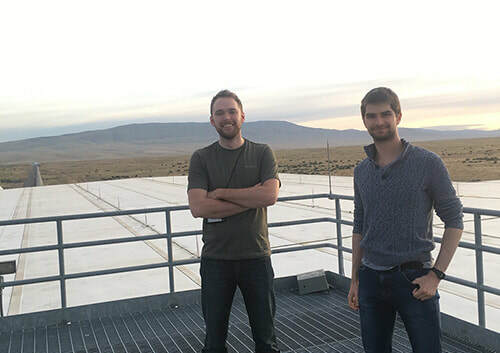 Myself and students have spent much of the last year onsite at LIGO helping to prepare these systems for the next observation run, and now I’m eager to see what new discoveries they’ll enable”. So far LIGO and Virgo have seen ten binary black holes and one binary neutron star. “Binaries containing both a neutron star and a black hole should be out there too, so it would be great to pick up a signal from one of those as well!”, says OzGrav’s Dr Hannah Middleton (University of Melbourne). “It would also be fantastic to observe something completely different. So far the signals we have seen are all short duration, lasting several seconds at most. There should also be very long duration signals in the data, these are called continuous gravitational waves”. Those kinds of gravitational waves are expected to come from rotating neutron stars. OzGrav researchers at University of Melbourne are working on applying signal processing techniques in order to pull these incredibly faint signals out of the data. An international group of scientists, including dozens of Australians, this weekend announced the detection of the most massive binary black hole merger yet witnessed in the universe. The black hole that resulted from this cataclysmic event is more than 80 times as massive as our Sun. The discovery of GW170729 – along with evidence of nine other black hole mergers – comes just over one year since scientists announced they had witnessed, for the first time, the violent death spiral of two dense neutron stars via gravitational waves, another set of major astrophysical discoveries have been announced in the US. The series of papers including the work of the Australians, all from the ARC Centre of Excellence for Gravitational Wave Discovery (OzGrav), present the full catalogue of observations of binary black hole and binary neutron star mergers from the first two observing runs (2015, 2016-17) of the Advanced LIGO (US) and Advanced Virgo (Italy) gravitational-wave detectors. According to Dr Meg Millhouse, from OzGrav and the University of Melbourne, the papers outline a catalogue of all gravitational wave signals "heard" by the Advanced LIGO detectors in the last three years. “These signals are generated by some of the most violent events in the universe, when pairs of neutron stars and black holes – each with many times more mass than our sun – come crashing together,” she said. Dr Simon Stevenson, from OzGrav and Swinburne University, said that the additional information of the other nine binary black holes, “means we are learning things about the population, such as how frequently binary black holes merge in the universe (once every few hundred seconds somewhere in the universe) and whether small (low mass) or large (high mass) black holes are more common -- there are many more light black holes (around 5-10 times the mass of the sun) in the universe than heavy black holes (around 30-40 times the mass of the sun), but the heavy ones are ‘louder’ in gravitational-waves, and easier to ‘hear’ colliding,” he said. “With each new detection we learn something more about how these extraordinary objects came to be. The detections also help to answer questions about the theory of gravity, the formation of galaxies, and how heavy elements (including gold and platinum) are produced”, said co-author Dr Xu (Sundae) Chen from OzGrav and the University of Western Australia. Another author, student Colm Talbot from OzGrav and Monash University, in a separate paper describes how the detection of these new black holes will assist in understanding the Universe’s entire population of black holes. “Each of these black holes formed from huge stars which died in violent explosions called supernovae. By studying these black holes, we act as black hole archaeologists to learn how these cosmic giants die,” he said. Last year Dr Paul Altin from OzGrav and the Australian National University was part of LIGO's "rapid response team", whose job it is to be ready to receive a detection alert at any time, day or night, in order to quickly analyse the data and decide whether the event is significant enough for an alert to be sent to our partner astronomers for follow-up observations. According to Dr Altin, in 2019 Advanced LIGO comes back online with even higher sensitivity, in part due to the use of quantum squeezing. “Squeezing allows us to get around noise that comes from quantum mechanics, the fundamental theory that governs microscopic particles,” he said. The Advanced LIGO squeezer was designed at ANU and is currently being installed in the US. Several OzGrav members are currently in the US at LIGO Hanford installing upgrades to the detector. 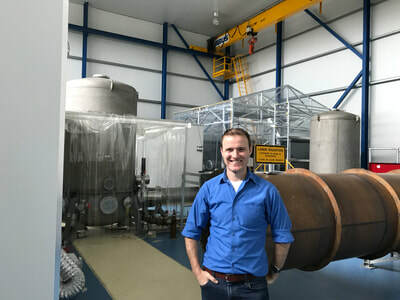 According to Dr Dan Brown, from OzGrav and the University of Adelaide, the next observation run aims to use squeezed light to reach the target sensitivity to look for extreme events. 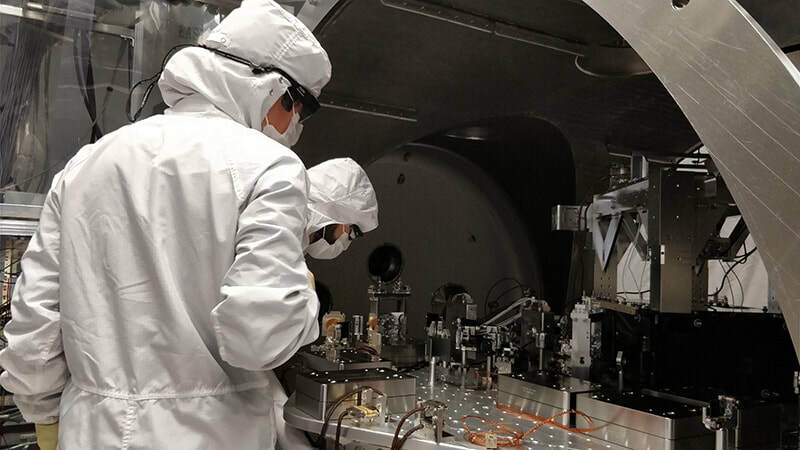 “With OzGrav's expertise in squeezed light and adaptive optics for compensating thermal effects from the increased laser power we're making significant contributions towards improving LIGO for the next run,” he said. Research for LIGO-Voyager - early R&D for deployment around 2027-2028. Three weeks were spent at the University of Adelaide working with Peter, David, Seb, Daniel, Cao, Alexei, Deeksha and Craig. I worked with Craig to help him improve and simplify his COMSOL model of the optical absorption measurement system. Dan and I worked on developing a realistic Finesse model of Voyager that could be used to simulate intensity and frequency noise coupling through the future interferometer and thus allow us to set noise requirements. Extensive discussions were held with Dan and Peter on how Adelaide can continue to support the Hartmann sensor (HWS) code for LIGO. I also discussed the cavity eigenmode modulation (CEM) technique for cavity mode-matching and alignment that Alexei has developed. 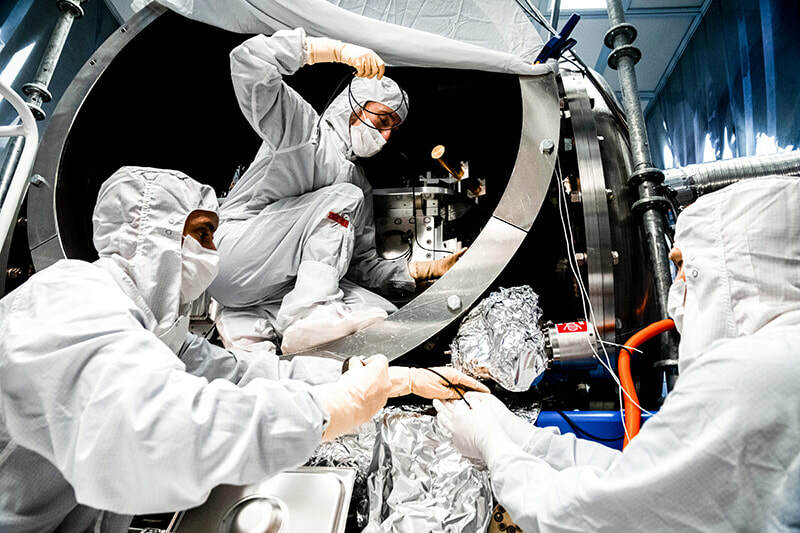 A+ is a medium-scale upgrade to Advanced LIGO (aLIGO) that will introduce frequency dependent squeezing and new coatings to the aLIGO test masses. Much of the trip was focused on development of adaptive optics, designed at Adelaide, for use in A+. Successful deployment of these optics will significantly reduce the complexity of the A+ adaptive optics system and could potentially reduce the budget for this system by $200k or more. The third generation of LIGO will be called LIGO-Voyager and will require, amongst other large-scale upgrades, a 2-micron laser source so Seb showed me the one that UoA are developing. At UWA, I had long discussions with Zhao and gave some input on their plans to develop technologies for Voyager. The Gingin facility is potentially the only site in the next few years to have a suspended Fabry-Perot cavity with silicon optics and two micron lasers and thus could be valuable for testing. I spent two days at ANU (overlapping with Rana Adhikari during that time). We provided input on the OzGrav proposal to build a high-frequency GW detector in Australia, and Bram and I discussed the requirements for two-stage tip-tilt. Postdoctoral research position at Monash University. Researchers are applying big data analysis techniques used in astronomy to better understand diseases of the eye and brain. 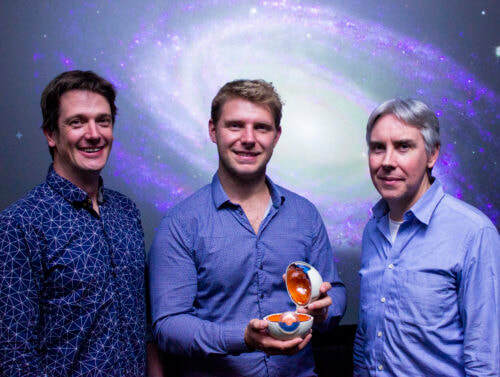 The team, led by ophthalmologist Dr Peter van Wijngaarden (CERA) and astrophysicist Associate Professor Christopher Fluke (Centre for Astrophysics and Supercomputing at Swinburne University and OzGrav), will be working together to apply the same big data analysis used by astronomers in their study of the universe, to the field of ophthalmology. The collaboration will be formalised thanks to a generous donation from Australian entrepreneur Dr Steven Frisken, CEO of ophthalmic tech company Cylite, who was one of four people jointly awarded the Prime Minister’s Prize for Innovation last night in Canberra. Daniel Brown from OzGrav’s team at the University of Adelaide travelled to MIT for the A+ Balanced Homodyne Workshop, 11-12 Oct, 2018. Overall this was a productive meeting which favourably demonstrated how the research being undertaken here in the Adelaide node of OzGrav is pushing the future detectors forward. 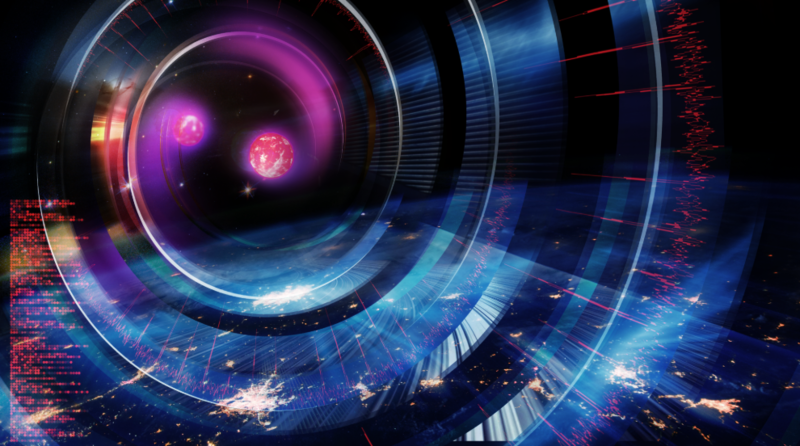 Recently the next iteration of the LIGO experiment was announced, named A+. This upgrade takes us from Advanced LIGO and further improves the sensitivity. One of the more involved upgrades is to change the gravitational wave readout scheme, from what is currently used and is called “DC Readout” to “Balanced Homodyne Readout” (BHD). Both of these techniques are employed to provide a strong optical field, called a local oscillator, at the output port, which beats with the optical fields generated by a gravitational wave and allows us to measure them on a photodiode. For A+ the plan is pick off a small amount of light from the power recycling cavity through one of its mirrors. We then have to shape and align this light correctly and combine it with the signal coming out of the detector. This beam shaping and designing of optical control systems is some of the core OzGrav research Daniel is undertaking at the University of Adelaide. The outcome of this meeting was that much work still needs to be done. The output part of LIGO is having a complete redesign. New suspension stages must be designed to accommodate the adaptive optic elements being developed at Adelaide. There is also scope for our new beam shape sensing technique to also be employed for controlling these adaptive elements. Next a control system must be designed and modelled for all this, which is being simulated in my modelling software Finesse. In the coming months we aim to write several design documents outlining all the new elements for the BHD system of A+. From March to June 2018 Sebastian (postdoc), Alexei (PhD student), and Daniel (postdoc) from the OzGrav team at the University of Adelaide travelled to the USA to attend the LIGO-Virgo Collaboration (LVC) meeting along with further trips to LIGO Hanford and the California Institute of Technology (Caltech). Finesse, which is used for understanding the complex optical interferometers that are at the core of gravitational wave detectors; we use this for design and commissioning work. Sebastian's main research focus is 2µm fiber laser development which is one of the core research topics for OzGrav instrumentation. His research is in the development of lasers for the third generation of gravitational wave detectors. Sebastian spent time during the LVC engaging with research groups focussed on the current and future laser systems. Following the LVC he travelled south to Pasadena to visit the Caltech arm of LIGO Lab. This gave him an opportunity to examine the material and detector technologies being developed for the future detectors. While there he helped design the optical layout for the signal recycling heater and characterise the CO2 laser. After this Sebastian joined Alexei and Daniel in Hanford and participated in the mode matching of the 70W upgrade to the prestabilised laser and helped with the implementation of the CO2 laser heater. Arriving at the LIGO site at first is nothing short of daunting. Usually we work on small table-top optics experiments. The physical size of the LIGO experiment always blows me away, from the size of the vacuum chambers to the arms that shoot out into the desert. The team at LIGO was amazing; their patience in teaching us how it all works and trust in us to let us work on the experiment really made the trip. the interferometer and will be used to better shape it for extracting the signal. This involved a lot of plumbing work (getting covered in aged coolant left in old pipes...) and aligning the CO2 laser into the vacuum chamber to correctly deform the mirror. Alexei also looked into how we can better interpret cavity mode scans to infer the correct way to shape the laser beam. From this we found that we can actually extract more information than we expected previously, such as the astigmatism of the beam. Using this knowledge he wrote a new commissioning tool for analysing the output mode cleaner scans in a more automated and easier to use fashion. We also helped in mode matching the squeezer beam to the interferometer and develop better Finesse models of the output path. Before we left we then also helped test the new Hartmann sensor system for sensing the deformations in the end test mass mirrors, something that previously had not worked optimally. See your future career in Gravitational Physics. Apply for admission at ANU by 31 October.